A team led by Johns Hopkins engineers has discovered some previously unknown properties of a common memory material, paving the way for development of new forms of memory drives, movie discs and computer systems that retain data more quickly, last longer and allow far more capacity than current data storage media. The work was reported April 16 in the online edition of Proceedings of the National Academy of Sciences. This illustration by Johns Hopkins doctoral student Ming Xu depicts the shape of diamond tips used to apply pressure that uncovered important new properties in the memory medium GST. 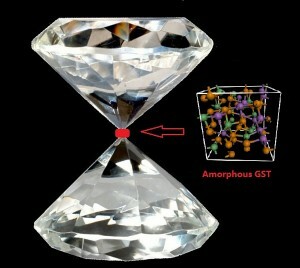 The inset represents the atomic structure of amorphous GST. The research focused on an inexpensive phase-change memory alloy composed of germanium, antimony and tellurium, called GST, for short. The material is already used in rewritable optical media, including CD-RW and DVD-RW discs. But by using diamond-tipped tools to apply pressure to the materials, the Johns Hopkins-led team uncovered new electrical resistance characteristics that could make GST even more useful to the computer and electronics industries. GST is called a phase-change material because, when exposed to heat, areas of GST can change from an amorphous state, in which the atoms lack an ordered arrangement, to a crystalline state, in which the atoms are neatly lined up in a long-range order. In its amorphous state, GST is more resistant to electric current. In its crystalline state, it is less resistant. The two phases also reflect light differently, allowing the surface of a DVD to be read by tiny laser. The two states represent ones and zeros, the language of computers. Although this phase-change material has been used for at least two decades, the precise mechanics of this switch from one state to another have remained something of a mystery because it happens so quickly—in nanoseconds—when the material is heated. To solve this mystery, Xu and his team used another method to trigger the change more gradually. The researchers used two diamond tips to compress the material. They employed a process called X-ray diffraction and a computer simulation to document what was happening to the material at the atomic level. The researchers found that they could “tune” the electrical resistivity of the material during the time between its change from amorphous to crystalline form. Other co-authors of the paper were Y. Q. Cheng of Johns Hopkins and the Oak Ridge National Laboratory in Tennessee; L. Wang of the Carnegie Institution of Washington in Argonne, Ill., and Jilin University in China; H. W. Sheng of George Mason University in Fairfax, Va.; Y. Meng and W. G. Wang of the Carnegie Institution of Washington; and X. D. Han of Beijing University of Technology in China. Funding for the research was provided by the U.S. Department of Energy, the Office of Naval Research, the Chinese National Basic Research Program, the National Science Foundation, the W. M. Keck Foundation and Argonne National Laboratory. Illustration available; contact Phil Sneiderman.